The recent disbandment of Telltale Games has brought a tear to many an eye. The popular studio has produced some of the most memorable games of the last two console generations, including The Walking Dead and Tales from the Borderlands. Of all their games, though, my favorite was always The Wolf Among Us. Its seamless stitching of fantasy with reality made for one of the most interesting game worlds I’ve ever had the honor of playing in. For that very reason, it’s worth discussing now. 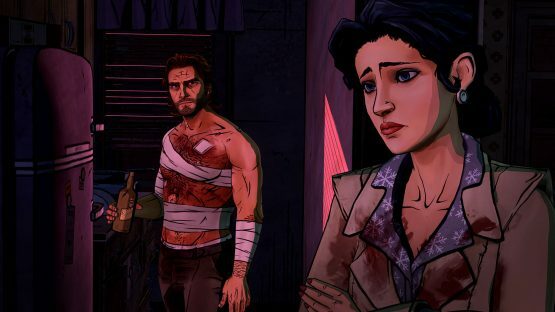 Based on Bill Willingham’s Fables comic book series, The Wolf Among Us is set in the fictional enclave of Fabletown in the year 1986. Fabletown is home to many characters from myth and folklore, all of whom fled from “The Homelands” due to the tyranny of the Adversary. Located in modern-day Manhattan, all Fables must purchase a “glamour.” Glamours are enchantments that allow Fables to alter their appearance in order to resemble an ordinary human being. This is obviously a necessary precaution for cohabitation, lest the world of Fables be discovered. Any fables who refuse to glamour themselves will be forced to go to The Farm, which is another area of respite away from The Homelands, but one that is strictly Fables-only. The player plays as Bigby Wolf, the glamoured form of the Big Bad Wolf from Little Red Riding Hood, and is tasked with unraveling the mystery behind the first Fable murder case in years. 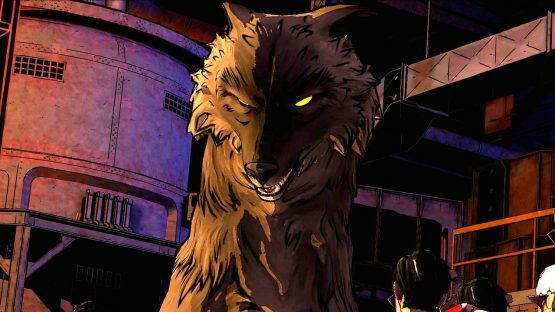 At its very core, the world of Fables, and by extension the world of The Wolf Among Us, is deeply rooted in fantasy. Which is rather obvious, considering that it’s about Snow White and Beauty and the Beast. However, by superimposing its fantastical logic onto reality, it at least achieves verisimilitude—the appearance of reality. This is perhaps the most important thing any fantasy needs to do if it seeks to be successful. In order for a fantasy world to be consistent, it must adhere to the logic that defines it. For a fantasy to be set in the real world, it must be able to compromise with the logic of reality. That’s why the simple idea of the glamour enchantment is quintessential to the story and the game world—if you’re going to create a game that has Snow White and Ichabod Crane roaming the streets of Manhattan, your first point of order should be to explain to people how they can walk around New York without being recognized. If you’ve got a half-decent reason for how that works, you’re on the right track. One of Bibgy’s main duties in the story world is to ensure that the rules of glamouring are enforced. As the Sheriff of Fabletown, he needs to maintain order, ensuring that everybody wears their glamours so that the existence of Fables isn’t revealed to the real world. If a Fable continuously refuses to purchase a glamour, Bigby is the one who must make sure that they’re brought to The Farm, where they can be as Fabley as they want. In a sense, it’s quite similar to Rowling’s Harry Potter, in that the magical world within our world is always at risk of exposure. 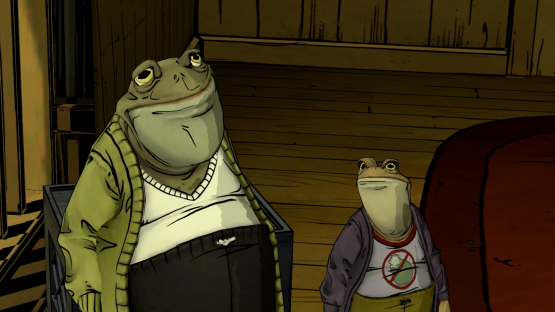 However, Fabletown is far grittier than Hogwarts, despite its deceptively idyllic name. It’s easy for the player to forget that Bigby is wearing a glamour, too. When the game’s tension becomes so taut that it’s about to snap, Bigby reminds the player that he was once the Big Bad Wolf. The fight with Bloody Mary sees him succumb to his inner lycanthrope. His maw sharpens, his skin spurts fur, his size accelerates at an alarming rate. Before you know it, the Sheriff of the Fables has become a monster more fearsome than Beowulf‘s Grendel—who is also in the game. The principle upon which the game world is built—that glamours are the illusory wall between humans and Fables—is also its main plot point. This development really puts the game in gear, as it throttles towards its denouement across a long and treacherous home stretch. In the final moments of the game’s final episode, a conversation with none other than The Little Mermaid herself causes the player to reevaluate everything up until that point. All of the Fables are obliged to wear glamours, remember? Even Bigby wears one, as mentioned above. Some glamours are available on the black market, too, for those who can’t afford to purchase glamours from the 13th Floor. It was a black market glamour that tricked Bigby into thinking that Snow had been decapitated. Glamours keep Fables hidden from the human world. However, they also allow them to hide amidst other Fables. The thread used to make the game appear to be real is simultaneously the thread woven through the plot in order to make the story consistent. It’s ingenious. That’s why this story is exemplary in relation to blending fantasy with reality—its foundation is subtle and functional, yet is somehow unpredictable at the same time. Glamours are the protective veil which hides Fabletown from the eyes of humans; however, they are also weaponized in order to plunge the world of Fabletown into the deepest depths of danger it has ever seen. Fabletown’s only defensive mechanism is simultaneously laden with a red button that could threaten to cause the whole enclave to crumble. A necessary evil, you could say. How tragically realistic is that?